Martin Clunes plays Portwenn’s local GP, Martin Ellingham, who was once a successful London surgeon until he developed a phobia of blood that prevented him conducting operations. After retraining as a GP, he applied for a post in the sleepy Cornish hamlet of Portwenn, where he spent childhood holidays. Much of the show’s humour revolves around Martin Ellingham’s interaction with the local Cornish villagers. Despite his surgical brilliance, Ellingham lacks vital personal skills and any semblance of a bedside manner, and often fails to understand other people. Dr Ellingham (referred to as “Doc Martin” by the friendly locals), much to his disgust, finds the surgery is in disarray. The medical equipment is beyond repair, and the patients’ records are a mess. To top it all he inherits the world’s most incompetent receptionist, Elaine Denham, who clearly resents Doc Martin moving in. As the village’s new doctor steps into the village he is encountered by a dog who seems to become besotted with him, following him into his house, car, surgery and even in his bed throughout both Series 1 and 2. Despite Doc Martin’s bitterness towards the dog, he ends up reluctantly liking it, after giving up with the villagers thinking Doc Martin is its owner. The community is united in horror at their miseryguts of a new GP. Doc Martin soon finds he needs all the allies he can get as he tries to negotiate his way around village life with humorous consequences. Martin is joined by a cast which includes Stephanie Cole as his Aunt Joan, who provides him with emotional support in the face of the disquiet among the villagers. Caroline Catz plays feisty primary school teacher Louisa Glasson. Doc Martin is attracted to her, but he is hopeless at personal relationships. Martin Clunes’ character was originated as Dr. Martin Bamford in the 2000 film Saving Grace. He then appears in two “prequel” television films made by BSkyB, Doc Martin and Doc Martin and the Legend of the Cloutie, in which viewers learn that Bamford, a successful obstetrician, finds that his wife has been carrying on extramarital affairs behind his back with his three best friends. After confronting her with the news, he decides to leave London and heads for Cornwall, which he remembers fondly from his youth. Shortly after he arrives, he gets involved in the mystery of the “Jellymaker” and, following the departure of the village’s resident GP, decides to stay in Port Isaac and fill the gap himself. Although the original deal was to produce two television films per year for three years, Sky Pictures folded after the first two were made, so Clunes’ company tried selling the franchise to ITV who generally liked it, but felt the character of Martin Bamford needed a little something more to him than just being a “townie” who is a little out of his depth in the country. ITV wanted something a little more edgy, so Martin Clunes came up with the idea of the doctor being unusually grumpy. In the process, the doctor’s last name was changed from Bamford to Ellingham, an anagram of the last name of new writer Dominic Minghella who was brought in to re-work the Doc’s backstory and create a new village of supporting characters. Quite often during the series there are references to people being “a bit Bodmin”. This is a reference to the fact that Bodmin was once the centre of mental health care for the South West, and was based at the former St Lawrence’s Hospital site and now at Bodmin Hospital. I love the series but would love to also buy the original 2 films that was shown on Sky back in 2003/4. But dont know where i can? EXTRAÑO A MARTIN Y LOUISA. ESPERO VER PRONTO LA SERIE 5. @admin: I enjoy these series,watched all 4 from our x-box 360. The way series (4) ended I was hoping for more.JUST WAITING! Thankgoodness for more of doc Martin a wonderful family show – and I hated to see it end – went to see where it was made when in England last year – wonderful location – thank you again for wonderful English TV series – nobody can make it like the English. Wonderful program, would really hate to see it ever end!!!!!!! We just love this show and can’t wait until the new episodes begin! Best TV series I’ve come across in years. The cast as well as the scenery is amazing! I love this series and have seen all of the episodes more than once. I can’t wait for season 6. Please let Martin and Louisa marry and live happily. The show has enough other conflicts with the sick people and the troubles they have. Louisa could become involved in Martin’s life and assist him perhaps and together they can rear their son. Yes I agree with most peoples comments on this series of Doc Martin and I to hope they make some new series with the original cast. It’s really an addictive series and well done. I’m an avid viewer and hoping to see more. Miss Doc Martin. Got my son-in-law to watch it also. Would like to see more episodes. 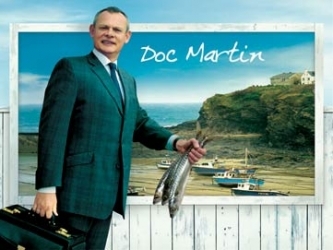 Just started watching Doc Martin via Netflix and have finished all of the episodes in just a couple of days. I really hope there will be a season 6… It is a wonderful show and the scenery is magnificent. Next time I’m in the UK, I want to go there. After watching the episode where Doc Martins family visits him , I was just blown away . It was a personal catharsis for me . I keep playing it over in my head . Who do you apologize too — Oh well the bell tolls for thee . I tuned into this series during the fourth season and was immediately hooked. I purchased all 5 seasons and sat down and watched from the beginning. What a wonderful series, it lifted my spirits thinking PBS would allow us a peek at some of the British series, Doc Martin, Larkrise to Candleford, and the Midwife, just to name a few. I find myself laughing out loud to Martin’s indeference to the villagers. Please, Please Please let there a 6th season and more.